See all Osteotomy Tibia CPT codes. Ideal patient is physiologically, young and active, <50y/o. Patient undergoing ACL reconstruction with a varus knee. Flexion contracture >15 degrees, ROM less than 90 degrees. Knee Arthrodesis-indicated for infection, failed TKA, young active patients, soft tissue defects, absent extensor mechanism, neuropathic joint disease. fusion in 10-15 flexion and 0-7 valgus. complications=infection, non/malunion, pain.successful in 80-90% of failed condylar components, 55% of failed hinged prosthesis. 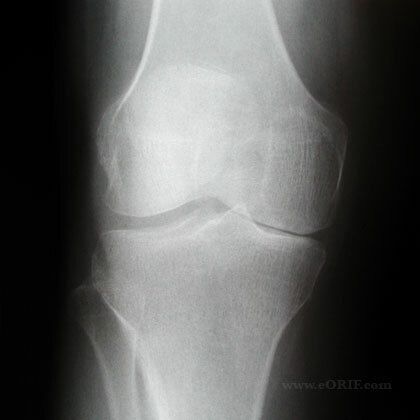 Generally considered a staging procedure for TKA. Indicated to delay TKA for 7-10 years and allow an active lifestyle during this time. draw line from center of femoral head to center of talus. This demonstrates the patients mechanical axis. Evaluate lateral xray for patella baja which is a contraindication to opening wedge HTO. Ensure appropriate instrumentation is available including large staples if opposing cortex is inadvertently violated. Ensure patients symptoms are consistant with diagnosis. Patellofemoral pain in a varus knee will not be improved by an HTO. Technique options = medial opening-wedge or a lateral closing-wedge osteotomy. Medial opening-wedge osteotomy is contraindicated in smokers because of concern for nonunion. When performing concomittant HTO/ACL reconstruction the proximal screws must be placed so that the anterior screw diverges anteriorly and the posterior screw diverges posteriorly so that the screws will not interfear with the tibial tunnel for the ACL. Locking HTO plates can not be used as they do not allow screws to be placed divergently. Lateral Closing Wedge Osteotomy: Provides bone on bone contact with improved healing potential. (Billings A, JBJS 2000;82A:70)Increased risk of peroneal nerve injury. Medial Opening Wedge Osteotomy: Smaller incision, intra-operative adjustment more easily performed. Increased risk of nonunion/hardware failure. Blunt Homan retractors placed anteriorly and posteriorly, protecting surrounding structures. Ensure retractors are placed directly on bone. Osteotomy guide pins are placed under flouroscopic guidance. Pins should pass just proximal to tibial tubercle and stop just medial to lateral cortex. Ensure proximal fragment is at least 15mm thick to avoid intra-articular fracture. Cutting guide is placed and osteotomy is performed under fluoroscopic guideance. Stop 1cm medial to the lateral cortex to ensure lateral cortex is not bridged. 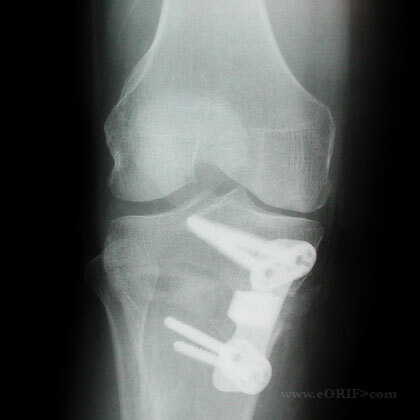 Osteotomy site is opened to pre-determined level with wedge or osteotomy hinge. Appropriate opening is verified fluoroscopically with long alignment rod, or electro-cautery cord placed from hip to ankle. If at any time the lateral cortex is bridged the osteotomy should be closed and the lateral cortex stapled through a minimal lateral incision. Interveing space is filled with bone graft. Cortical bone graft should be used for any defect >7.5mm. Post-operatively patient is placed in hinged knee brace, NWB for 4-6 weeks. Cosmesis: A varus knee will be converted to a valgus knee during a HTO and may be consider a cosmetic deformity by some patients. This should be discussed with all patients pre-operatively as part of the informed consent. Nonunion: less common after lateral closing wedge than medial opening wedge. Avoid medial opening wedge osteotomy if large correction is needed, or if patient is a smoker or diabetic. Peroneal nerve palsy(more common after lateral closing wedge osteotomy. 85% survivorship at five years, 53% at ten years with conversion to TKA as endpoint. (Billings A, JBJS 2000;82A:70). Rossi R, Bonasia DE, Amendola A. The role of high tibial osteotomy in the varus knee. JAAOS. 2011 Oct;19(10):590-9. Sprenger TR, Doerzbacher JF. Tibial osteotomy for the treatment of varus gonarthrosis. Survival and failure analysis to twenty-two years. J Bone Joint Surg Am. 2003 Mar;85-A(3):469-74. Erratum in: J Bone Joint Surg Am. 2003 May 85-A(5):912. Amendola A. Knee osteotomy and meniscal transplantation: indications, technical considerations, and results. Sports Med Arthrosc. 2007 Mar;15(1):32-8. Noyes FR, Barber-Westin SD, Hewett TE. High tibial osteotomy and ligament reconstruction for varus angulated anterior cruciate ligament-deficient knees. Am J Sports Med. 2000 May-Jun;28(3):282-96. Rossi R, Bonasia DE, Amendola A. The role of high tibial osteotomy in the varus knee. J Am Acad Orthop Surg. 2011 Oct;19(10):590-9.